Santosh is a boy with Cerebral Palsy, and needed physio therapy for his physical disabilities. He had above average intelligence and had joined regular curriculum after initial training at Swasraya. 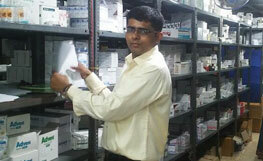 He cleared his 10th exam and rejoined Swasraya in 2013 and is an independent worker at the vocational unit. 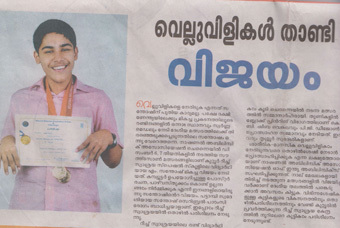 The highlight of his training was when he received two gold medals at the South zone level and Bronze medal at the national level Abilympics meet for waste re-use and computer poster designing. Ashiq Rasheed is a boy with Cerebral Palsy and has a history of Epilepsy since his birth and has been on treatment for the same till date. 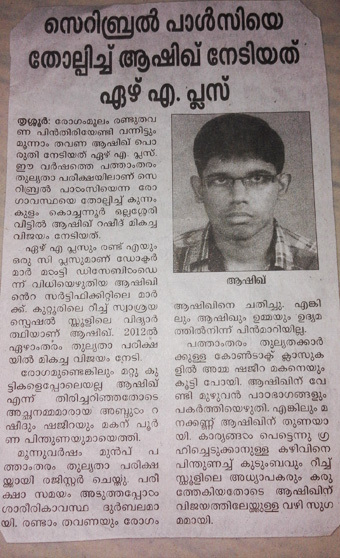 In addition he has perception problem and Intellectual disability which hindered his academic progress. He joined Swasraya in 2009. Ashiq managed to overcome all his disabilities and made a steady progress clearing his class 4th and 7th level exams through the continuing educational programme. His performance at the class 10th level exam with seven “A+” and three “A” was the talk of the town. Dixon TD was born with Microcephaly and joined Swasraya in 1996. He was detected with heart ailment & also lacked clarity in speech. With continuous training at Swasraya he managed to clear the VIII grade. He showed keen interest in art/craft & had an uncanny knack to pick up vocational skills. He was trained to be an independent worker, in the screen printing unit. 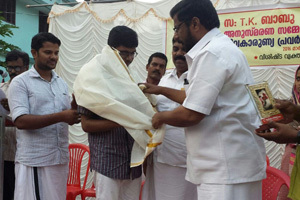 Dixon is now employed by a pharmaceutical distribution unit in Thrissur & has become a contributing member of his family. 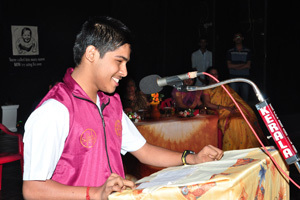 Has a keen ear for general knowledge – participated in quiz competition and won medals. 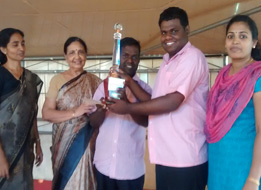 The vocational team represented by Linto and Sunil was the first prize for their Innovative product “Rhythm of Bamboo” at the State level Special Employees. Our students Yazir and Santhosh had attended the Computer based training programme at “Amba” project, Bangaluru and are at present the official trainers for the first batch. Sheeba K.B who had been rehabilitated at “Swasraya” as a supervisor at the screen printing unit has got a full fledged Govt. job at the Police academy.